View cart “Wallpieces: “Whistle Past the Graveyard” Ceramic Collage” has been added to your cart. An abstract arrangement of textured and glazed ceramic tiles evokes an outdoorsy moment of latigo, leaves and emblems. The tooled leather tiles are evenly balanced on a sandy tan marbled tile, extending over its edges at the top. The small leaf icon provides a crowning effect. 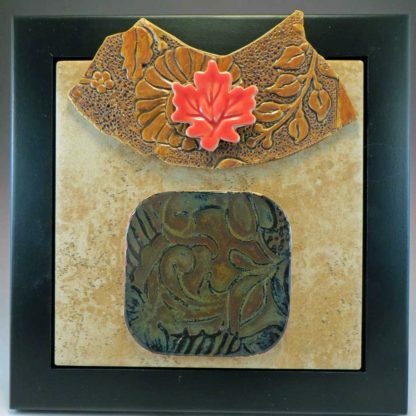 This framed piece features a square tan marbled ceramic tile in a square wooden frame and is made of collaged textured and glazed smaller tiles.